If you find yourself rotating between asking Alexa the weather and having her play music, it’s time to broaden your Alexa skills. But what are the best Alexa skills that are actually useful? Our infographic can help you figure that out. Click to open it for downloading or printing. Click to open for easy downloading and printing. Since no one has the time (or desire) to memorize a long list of Alexa skills, we gathered and tested the best ones and put them in a long list. Print this out and hang it next to Alexa for quick reference. Many skills that we’ve seen listed online just don’t work, but at the time of publishing this article, all of these worked for us. If any skills stop working, let us know in the comments and we can update the list. Below is the same list as in the printable, with a few descriptions for helping you get started with these skills. Whether you love movies or sports, these best Alexa skills for entertainment will make it easier to find whatever entertains you. Alexa, open the Tonight Show. Listen to Jimmy Fallon’s opening monologue through Alexa. Alexa, what movies are playing nearby? You can also ask about showtimes for specific theaters or movies. Alexa, find me a nearby sushi restaurant. Get the address and hours of nearby businesses. Alexa, what is the IMDB rating for Breaking Bad? Alexa, give me my sports update. This works best when you add your favorite teams in the app. You can specify up to 15 teams from several different sports leagues. Then Alexa updates you about those teams specifically. Click for more info on this skill. Alexa, open StubHub. This skills asks you to specify your city, then tells you events going on in StubHub nearby. There are plenty of skills that provide facts and information; here are a few of our favorites. Alexa, tell me a Chuck Norris fact. Alexa, tell me a dog fact. Alexa, play the Dave Ramsey show. As a podcast fan, I’m hoping more shows become accessible like this. It’s cool and useful to hear the original show played through your Alexa. Alexa, what’s in the news? or Alexa, what’s my flash briefing? You can specify your news outlet of choice, or let it default to NPR. Alexa, play my audio book. Or skip to the next chapter. You can also have it read Kindle books, as we showed in this video. Alexa, what’s 12 times 14? Alexa, open on this day. Find out historical events that happened in the past on this date in history. Alexa, ask aurora. Hear the forecast for the Northern Lights. It won’t tell you the forecast for your exact date, but anytime in the next week usually works. You also can’t pick a date too far in the future. Alexa, open translator. Translate “I am your father” in Chinese. I found this skill works best when you start with the “open translator” command. I tried to have it translate Vietnamese, but it said no, or as you would say in Vietnamese, “Không.” Of course, I had to ask a Vietnamese speaker how to say that, because Alexa wouldn’t tell me. Alexa, open the Bible. This is a third-party app that narrates different chapters. You can say “read Genesis 1” and it will dive right in. The narration seems quite good. Control your entire smart home using these Alexa skills. There are many more compatible smart home devices, and the list only keeps growing. Alexa, turn on Christmas tree. Plug your tree into a TP-Link smart plug to turn it on and off with Alexa. Alexa, tell Harmony to turn on the TV. 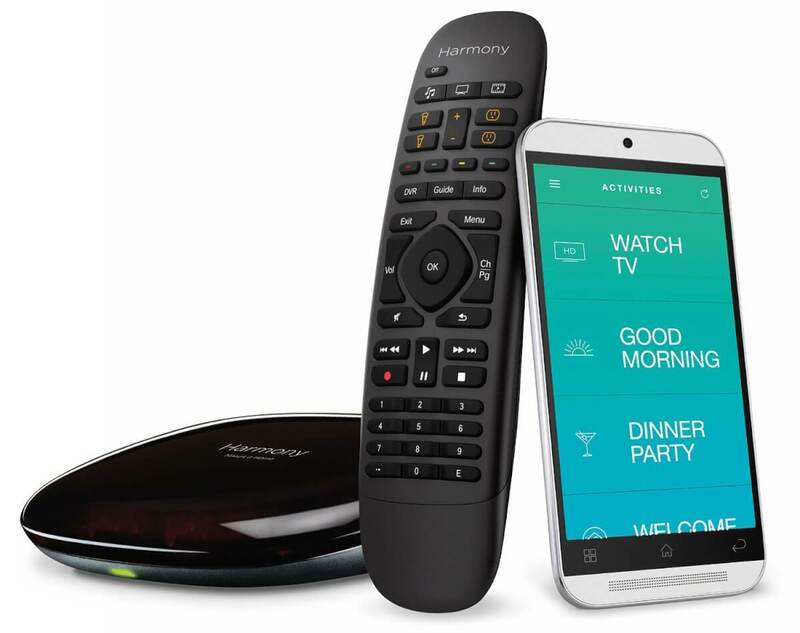 If you have the Harmony remote and hub, you can turn your TV on and off with Alexa. Alexa, ask Trackr to find my phone. After you enable the Trackr skill, download the app, and integrate with your Alexa, you can ask Alexa to call our phone whenever it’s lost. Follow the steps here. Alexa, tell Rachio to water the lawn for 15 minutes. Rachio smart sprinkler controller lets you schedule your lawn watering with the app and automate it to skip watering whenever it’s raining. You can also control it with Alexa and have it water specific zones. Alexa, lock the front door. Several smart locks work with Alexa, including the locks that are SmartThings compatible like Schlage and August. For security reasons, you cannot unlock your front door using Alexa; only check the status or lock it. Alexa, set thermostat to 70. You can also ask Alexa what the current temperature is to help you decide if the temperature needs adjusting. Ecobee3, Nest, Sensi, and others work with Alexa. See all compatible thermostats in our best thermostat comparison. Alexa, tell Garageio to close my door. 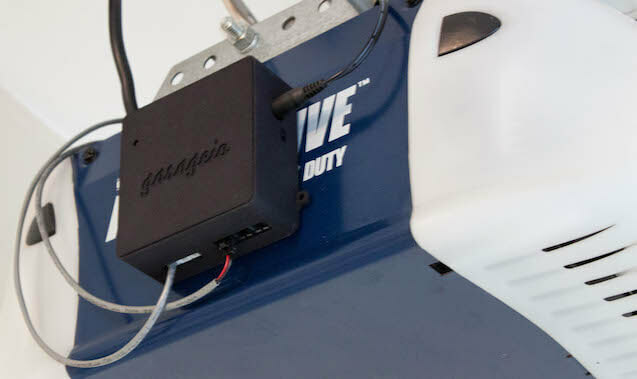 Other commands: “Tell Garageio to open my door.” “Ask Garageio is any of my doors are open.” You can also specify different garage doors to open or close if you buy the 2-door set. Alexa, arm away mode. Arm and disarm your Scout alarm system with Alexa. Scout is a DIY alarm system that charges very small monthly fees compared to other security systems and still offers great professional monitoring. You can easily follow recipes through step-by-step assistance from Alexa. 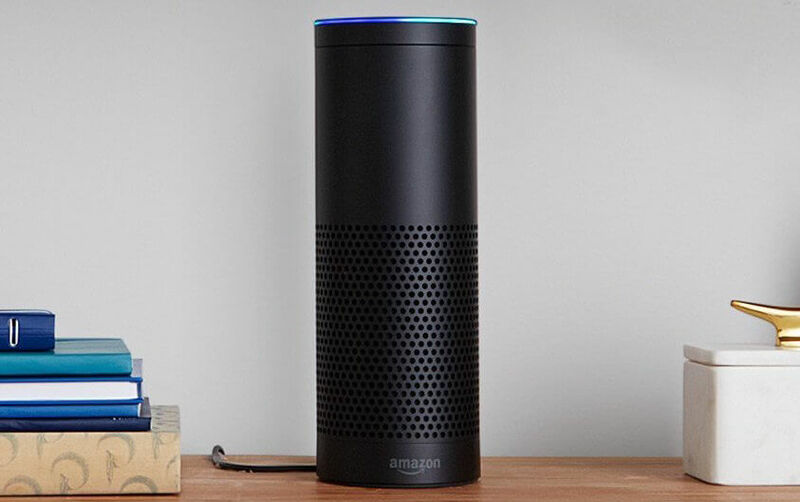 These are the best Alexa skills for the kitchen. Alexa, how many quarts are in a gallon? This is one of the best Alexa skills since your hands are usually busy while you’re cooking, making it annoying to pull out your phone and Google it. 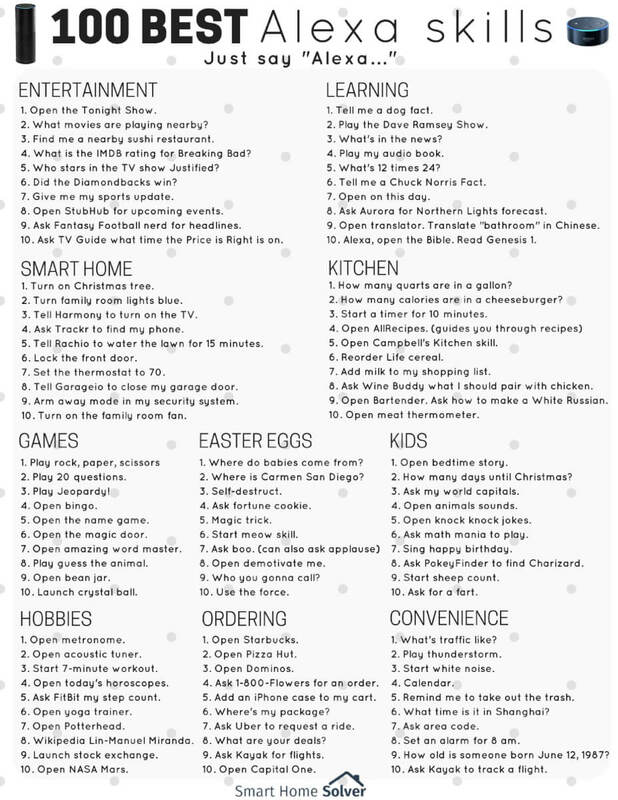 Instead, ask Alexa a wide range of kitchen conversion questions. Alexa, how many calories are in a cheeseburger? Alexa, start a timer for 10 minutes. Alexa, open Allrecipes. This is a newer skill that is super useful. Alexa guides you through recipes and can even access your saved favorites if you have an Allrecipes account. Alexa, open Campbell’s Kitchen skill. This skill is perfect for when you don’t know what to cook for dinner. It walks you through different types of dishes until you find the perfect dish to cook. Then you get step-by-step directions until the meal is finished. 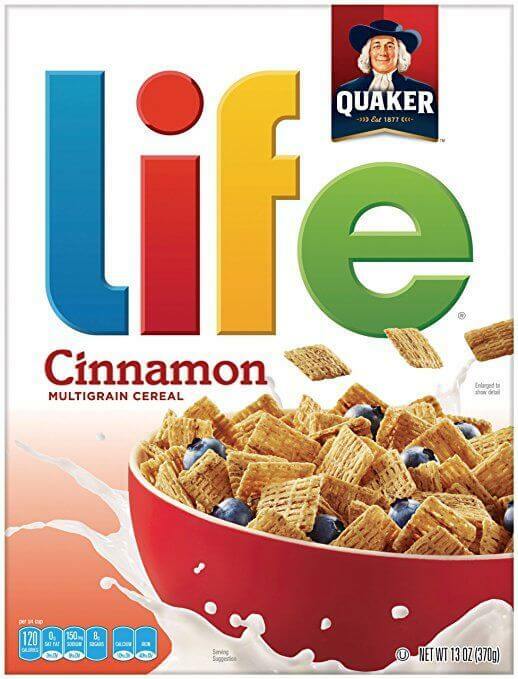 Alexa, reorder Life cereal. Buy pantry items on-the-go. Alexa, add milk to my shopping list. Alexa, ask Wine Buddy what I should pair with chicken. This skill was tricky; you can’t say my chicken, just chicken. But, after some tinkering, it worked! Alexa, open Bartender. Once it’s open, ask how to make a white Russian or other types of drinks. Alexa, open meat thermometer. Then you can ask what is the best temperature to cook chicken and other meats. Alexa can be the life of the party with these challenging games. 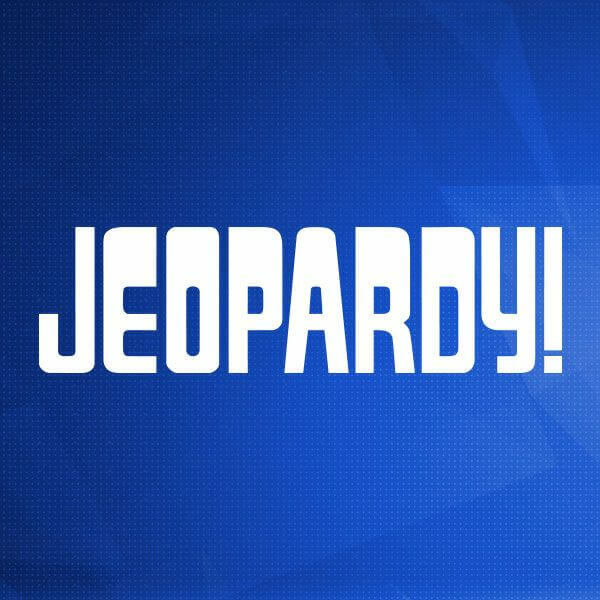 Alexa, play Jeopardy! This pulls the extra 6th clues from each Jeopardy! category and quizzes you on them. Alexa, open Bingo. Great skill for calling out Bingo at your next party. Alexa, open the name game. Funny game personalized to your name. Alexa, open the magic door. Choose Your Own Adventure-type game with special sound effects. Alexa, open amazing word master. Alexa, play guess the animal. Alexa, open bean jar. This skill allows you to give different “beans” to different members of the family to keep track of chores and good deeds. You need an account to get started. Some of the best Alexa skills aren’t necessarily useful, but they are funny. That’s why we made this Easter eggs category. Alexa, where in the world is Carmen San Diego? Alexa, ask boo. You can also ask for applause. Alexa, open demotivate me. Perfect when you just really need an insult. Kids are obsessed with Alexa. My own little girl is always shouting commands at her. These are the best Alexa skills for children, with many games and interactive skills that kids will love. Alexa, open bedtime story. I love this skill! It puts your child’s name into a cute bedtime story. Alexa, how many days till Christmas? Alexa, ask my world capitals. Alexa, open animal sounds. This plays realistic-sounding animal sounds that will definitely entertain kids. Alexa, open knock knock jokes. Alexa, ask PokeyFinder to find Charizard. Find out the details about the different Pokemon in your life. Alexa, start sheep count. I think this is designed to put you to sleep, but it’s way too annoying for that (plus it can only count down from like 10 sheep). If anything, it’s good for learning numbers with kids. Alexa, ask for a fart. Many people play a musical instrument, but they probably don’t know that Alexa can serve as a metronome. There are plenty of other great Alexa skills that can help you with your hobbies. Alexa, open metronome. Set the beat and Alexa will help you keep time. Alexa, start the seven-minute workout. Alexa, ask today’s horoscopes to tell me Scorpio’s horoscope. Alexa, open yoga trainer. You can start a yoga session and Alexa will walk you through breathing and poses. Alexa, open Potterhead. This quiz is great for Harry Potter lovers. Alexa, Wikipedia Lin-Manuel Miranda. Find out more about whatever you’re obsessed with by asking Alexa to read the Wikipedia page for it. Alexa, open NASA Mars. Then you can ask Alexa to give you a Curiosity Rover update. The list of food items that you can buy with Alexa is growing quickly. Here are some of the best Alexa skills for shopping with your voice. Note that most of these require you to set up an account with the restaurants and enable their skill. saved with your profile for quick ordering. You can also have Dominos track your order to see when it will arrive. Alexa, ask 1-800-Flowers to order flowers for mom. You can also specify the date you want the flowers sent and which type of arrangement you prefer. Alexa, add an iPhone charger to my cart. 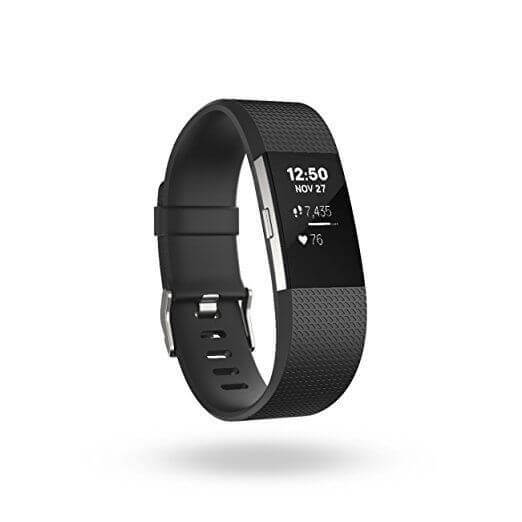 Even if it doesn’t add the specific item you like, this will remind you to buy the item later. Alexa, where’s my stuff? Track your Amazon packages. Alexa, ask Uber to request a ride. After you enable this skill, you can order an Uber, and then ask how far away it is. Alexa, what are your deals? Find out the exclusive Alexa-only deals available from Amazon. Alexa, ask Kayak for flights. Plan your next trip hands-free with Kayak. This is a useful skill for when the family is sitting around the kitchen daydreaming about their next adventure. Alexa, open Capital One. Once you enable it, Capital One will state your balance. You can even pay off your credit card. Amazon Echo, Echo Dot, and Tap are all designed to make our lives easier. These are the best Alexa skills for adding convenience and making things easier. Alexa, what’s traffic like? Establish your work location in Google Maps and you can even ask Alexa how long it will take to get to work. Alexa, calendar. Find out what’s coming up for the day. Alexa, remind me to take out the trash tonight at 8pm. Alexa, what time is it in Shanghai? Alexa, ask area code. This launches its own skill that lets you search any area code by saying the numbers. Alexa, set an alarm for 8am. Psssst: you can also snooze it the next morning. Alexa, how old is someone born on June 12, 1987? Find out your exact age in days, months, and years. If you want to know. Alexa, ask Kayak to track a flight. Once Kayak is enabled, you can track specific thestatus of specific flights, search for hotels, and find out where you can go within your budget. Well, there’s our full list of best Alexa skills. We tried to include the unique ones that people don’t usually think of instead of the standard go-to commands. 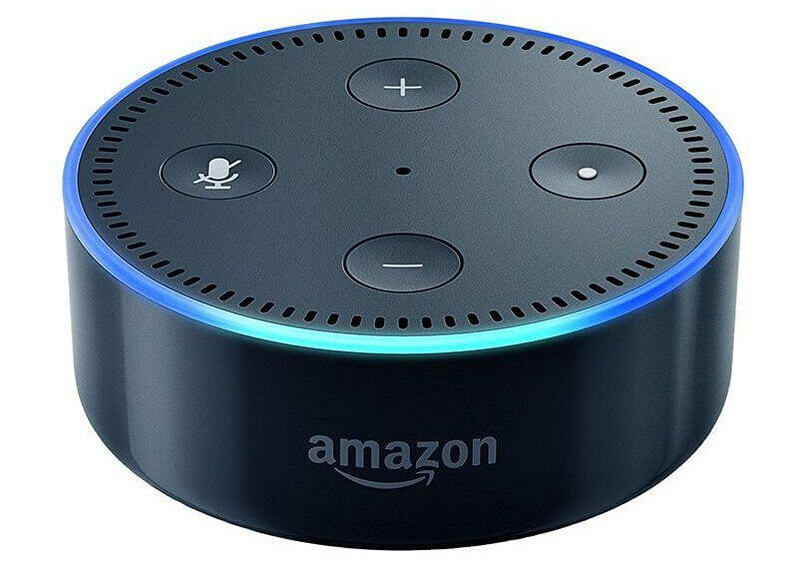 If there are any interesting best Alexa skills that we missed, feel free to comment them below to help our list keep growing.